We have been owned by Dalmatians since the Spring of 1992 and have dedicated ourselves to learning and doing all we can to improve R favorite breed. In 1996, Harry became R first champion. 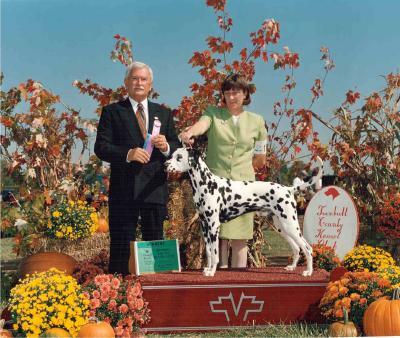 He was also Nationally ranked by The Dalmatian Quarterly that year for Best of Breed wins. In December 1996 I put the last 5 points on Harry's daughter, Sally, making her a champion. Puppies from R-DALS first litter made their debut in 1997 with 3 boys picking up points. Butch and Sundance both finished within a month of each other becoming R first homebred champions. The Dalmatian Quarterly National Statistics for 1997 showed Casey ranked at #6 Top Producing Dam and Harry ranked #15 Top Producing Sire. Harry was also Nationally Ranked at #42 for Best of Breed Wins and #56 for Group Placings. In 1998, we finished Libbie and put breed wins on all R dogs.